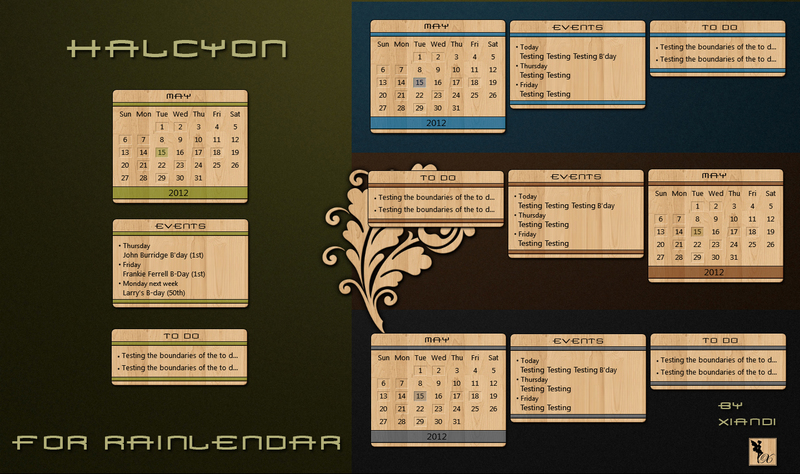 Halcyon is a light wood theme with color accents. The zip contains all 4 different colored calendars. Sweet!! I don't use Rainy, but I skin it. You knocked it out of the park!!! You have made an incredible suite. And just in time... I was ready for something different. I needed to let you know that the zip file only contains the normal color, not the other 3. Looking forward to an update as I love the blue. Thanks. Oops! I'll fix that. Sorry! This is so beautiful!! I get so excited when there is a complete suite of skinned yumminess!! Nice suite Cyndie. Now to go get the rest of the stuff.